It's official. Sen. Pete Domenici endorsed Heather Wilson in the Republican Senate primary late Friday -- just two weeks after he said he wouldn't endorse anyone. Wilson announced the endorsement at a televised debate Friday night. But the offical statemetn didn't come until almost an hour and a half after the debate. It was the Club For Growth ads -- the ones that call Wilson a "liberal" -- that pushed him over. 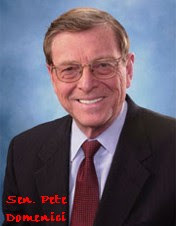 Domenici had raised the possibility that he might make an endorsement if one of the candidates did something "untoward." Readers of my column (and this blog) might have suspected something was up last week when I asked a Domenici spokesman if the senator considered these ads "untoward" and I got a "No comment" in response. The big question now" Is it too late to help Wilson, who is behind in the polls. "Heretofore I have been reserved in commenting on the Republican primary race for the U.S. Senate. However, I have become increasingly concerned that, even after I asked that the Club for Growth not be allowed to try to influence this election, they put at least $200,000 in television advertising in this race to try to do just that. I continue to believe that such outside influences should not be used to try to influence the voters of New Mexico. "As I said today in Socorro when asked about tonight's debate, Heather Wilson is the brightest member of Congress I know and I hope she wins. I do want to tell all New Mexicans that today I cast my vote for Heather Wilson in the Senate race. Having brought her into politics, I have the utmost confidence in her abilities to serve New Mexicans and Americans..". Here's one of those Club for Growth ads. I believe this is the one that stuck in Domenici's craw.